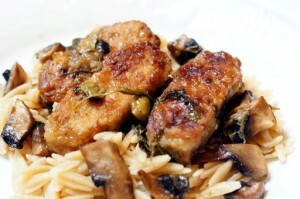 I love to make this recipe with our Black-Eyed Pea Tempeh. I think the citrus really complements the earthy flavor of the Black-Eyed Peas. Slice Tempeh into about 12 equal pieces (see picture). Place in a saucepan with tamari and enough water to cover; simmer for 10 minutes. While it’s simmering, prepare marinade. When Tempeh is done and still hot, remove from water and place in marinade. Marinate at least 2 hours; overnight works best. Now you’re ready to prepare the picatta! Dredge Tempeh in Egg Replacer then dust in flour seasoned with salt, pepper and nutritional yeast. Add oil and Earth Balance to a deep skillet. Brown Tempeh in skillet over medium heat (about 3-5 minutes each side). Remove Tempeh and set aside. In the same skillet, add water and mushrooms; cook for 1 minute, using spatula to pick up all the brown bits and cooked flour in the bottom of the skillet. Add wine, lemon juice, lemon zest, capers, and parsley, bringing to boil. Return Tempeh to skillet, reduce heat to simmer, and cook for about 10 minutes, turning Tempeh half way through. The liquid will get pretty thick. Keep an eye on the pan so the liquid doesn’t completely boil away; when the Tempeh is good and hot and it’s all thick and yummy-looking in the pan you’re ready to eat! Serve with vegetables and pasta or grains. Becky Taylor is a lifelong vegan and co-owner of The Hearty Vegan, a Tempeh shop in Austin, TX. Raised by an animal rights activist, Becky has teamed up with mom, Beth Taylor, and they have set out to share their love of Tempeh with the world.